The harbour at Apia on Samoa over the 15th and 16th of March, 1889 was the site of one of the most amazing naval confrontations in the 19th Century. Both the US and Germany were trying to expand their spheres of influence in the Pacific as well as obtain coaling stations in advantageous areas. One such location was the island of Samoa and the harbour at Apia. The Germans had been trying to take over the island, with the permission of the British, it seems, and there are grounds here for some nice little colonial skirmish Wargames. The ships involved in this event are all described in Conway’s All The World’s Fighting Ships: 1860-1905, probably one of my favourite books. The page references below refer to this edition of Conway’s. In Apia Harbour on that fateful day were, amongst other vessels, 7 ships of war. 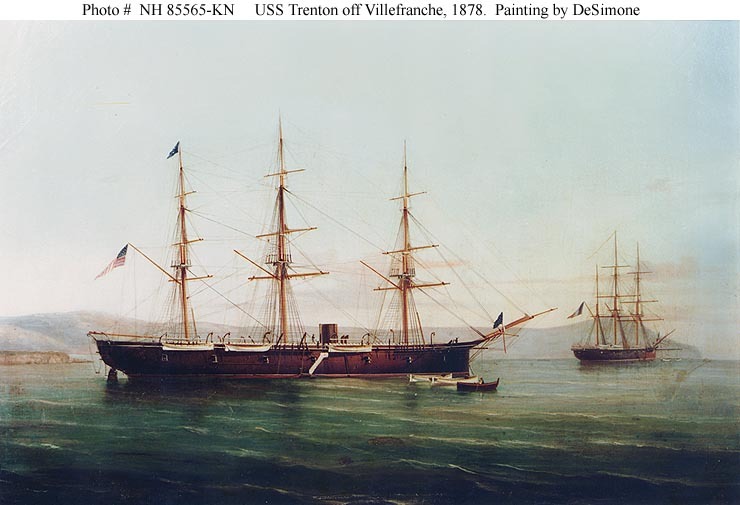 The Americans were represented by USS Trention (pg 126), USS Nipsic ((a Kansas Class Gunboat)) (pg 130) and USS Vandalia ((a Galena and Vandalis class sloop)) (pg 127). The Germans were represented by the SMS Olga ((a Carola class corvette) (pg 252), the SMS Adler ((a Habicht Class gunboat)) (pg 260) and the SMS Eber (pg 260). The British were there too with HMS Calliope ((a Calypso class steel corvette)) (pg 54) flying the Union Jack. The reason the US and German vessels were there was due to the political unrest in Samoa at the time. The US appear to have perceived the German presence at Samoa as contrary to US interests in the Pacific. The British were also there but more in a position of just watching what was going on. The US commander was Rear Admiral Lewis A Kimberly aboard the Vandalis and he appears to have ignored the threatening weather. Local advice from Samoa was that the hurricane/typhoon/cyclone season ((actually, as it is the South Pacific Ocean I think that it was technically a cyclone)) was past there was no danger. I think that the fact that the Germans were still there an not moving may have persuaded the Admiral to remain in place as well. The Germans were also remaining in the harbour, presumably because the Americans were. The ships in the harbour all started a mad scramble to make themselves safe and to get steam up to head out to sea to ride out the Cyclone. The Calliope managed to get steam up and to sail out of the harbour into the teeth of the cyclone. 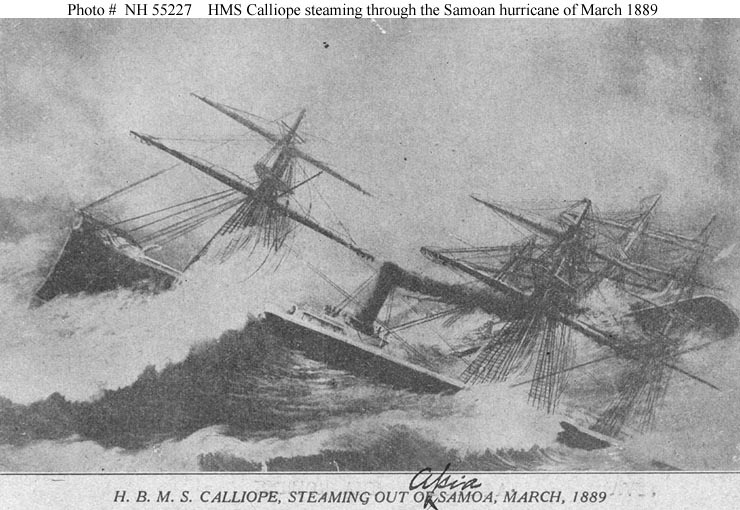 The Calliope was making a 1-knot headway against the cyclone as she steamed up the harbour. In the meantime, the Americans and the Germans were trying to fire their engines up and secure their anchors to ride out the storm but these were not strong enough to resist the cyclone. The Eber was blown onto the reef in the harbour and wrecked with the loss of most of the crew. 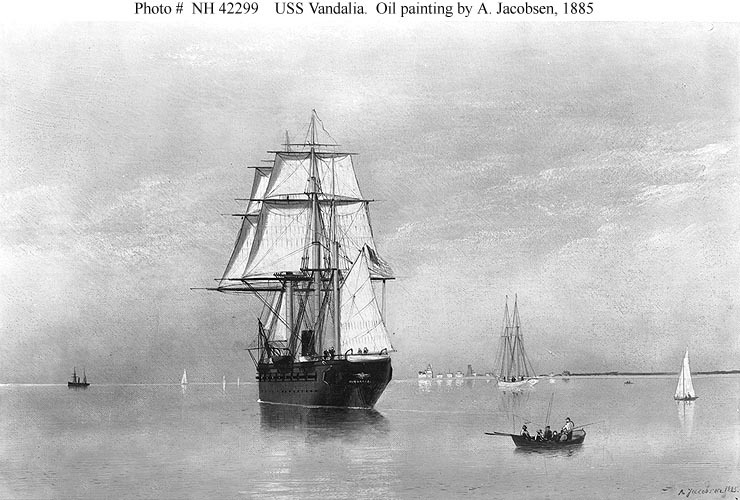 The Adler and the Vandalia suffered heavy crew casualties and were wrecked beyong the possibility of recovery. Meanwhile the Trenton‘s steam powerplant was extinguished by water entering the hause pipes. She dragged her anchors and was wrecked after running aground with light casualties. The Olga and the Nipsic were run ashore and later hauled off and repaired. So the score was Great Britain 1, US 0, Germany 0, the Cyclone 6. There were some interesting after effects from this. Of course part of Samoa later became a US protectorate (the half that provides wrestlers to the WWE) whilst the other half (the half that provides good rugby players) became part of the British Empire for a time. The hurricane also marked the passing of the old US Navy. The wooden cruisers and muzzle-loading guns along with full sailing rig and limited steam power were replaced over the coming years. They were replaced by the US New Navy of steel ships, powerful engines and modern guns. These all started entering service later that year. 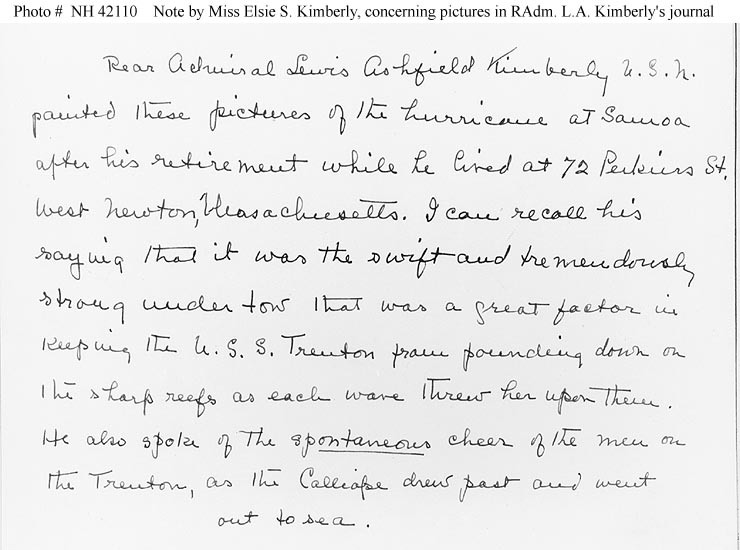 All images in this article are taken from the Online Library of Selected Images and the Naval Historical Center, an official US Navy website and the location of thousands of wonderful photographs. In late 1800's a treaty was signed, that split Samoa between American Samoa (to US) and Western Samoa (to Germany). In WWI, New Zealand took over control of Western Samoa from Germany, and independence in early 1960s. I dont see how that relevent to be honest. I’m glad the US Navy has record of the 1889 hurricane in Apia, Samoa. You’ll hardly find it in History books, and the Samoan government had opted to reclaim the area that those wrecked ships used to be – it’s now the site of the Government Building on the reclaimed area in the middle of Apia township.